Be sure to check out the WebComic Planet Webcomic Readers Choice Awards. 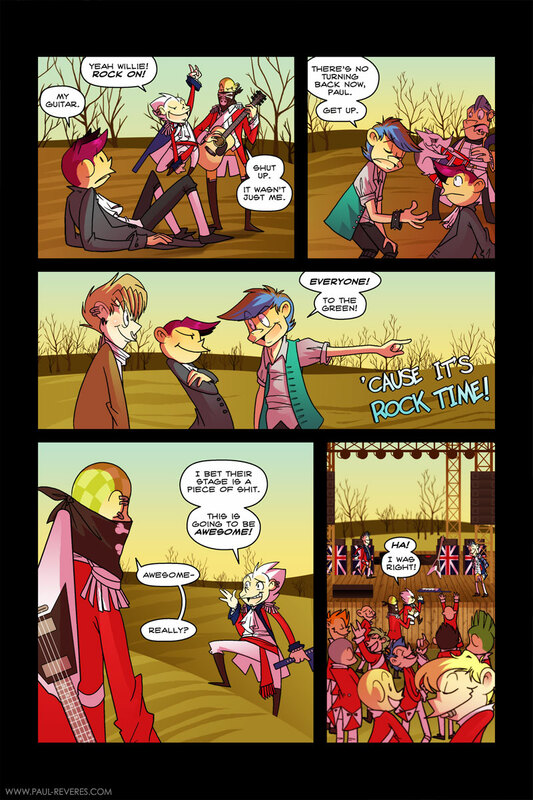 The Paul Reveres has been nominated among other awesome comics in the “Art” Category. It’s easy to make an account on the site to vote and there are a lot of cool webcomics to vote for, so give it a try. The excitement is killing me, WHAT WILL HAPPEN! I’m going to assume you don’t know about this part of history. What will happen. OMG. Nah, you know there will be rocking, and, perhaps awkwardness. Wouldn’t want to disappoint. Yeah, the vote incentive was a weird one all right, but at least Johnny wasn’t touching any unsuspecting butts. XD The last panel looks really good, by the way – I think it’s those trees and hills in the background. The trees look cool, but also it gives the panel a lot of depth. Neat. I didn’t realize I gave Henry Johnny eyes in the vote incentive. I subconsciously think of being creepy to automatically mean I’m drawing Johnny. Thanks for the comment about the background too! I tend to like my backgrounds more when there’s a lot of different things going on because I try harder at them. The next pages will have this stage environment, so it should be fun. Ha, I don’t think any stage would be good enough for Benedict. I thought it was so funny. It boosted my love for the twins and Willie. Wonder what kinda stages Benedict is used to, cuz thats a pretty bitchin stage, I must say. Heh. I’m pretty sure he’s just a whiner. Man, don’t these guys sleep?! I love the color palette you chose for these dawn pages. Lianne, this is war… or the beginning of, anyway. Sleep can come later. Rocking totally happens next page. Really really. Really.